In GitHub, add a new feature called Mortgage Calculator using a feature branch. Verify your change using Review Apps. Create a second pull request to trigger the creation of a review app. Merge the New Features into the master branch. Heroku Pipelines is a Continuous Delivery tool. Pipelines are useful for managing multiple environments for your app. Using Pipelines removes manual work from the process of promoting code. A popup appears asking if you want to inherit the same configuration as the app that is being used for your staging environment. Select Create new review apps for new pull requests automatically. Open a separate tab and navigate to your GitHub repo at https://github.com/YOUR_USERNAME/intro-to-heroku. Click the to edit the file. Copy this snippet of code and add it after line 20. This adds a new header called Mortgage Calculator in the DreamHouse navigation sidebar. Scroll to the bottom of the page. 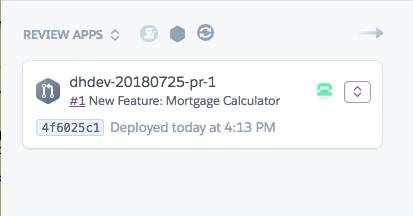 In the Commit Changes box, type New Feature: Mortgage Calculator. Change the description to Adding the Mortgage Calculator feature to navigation. Keep the default branch name. Review apps run the source code in any GitHub pull request in a complete-but-disposable app on Heroku. You can configure review apps to be created automatically for each pull request. Return to the Heroku dashboard, https://dashboard.heroku.com. Click dreamhouse-pipeline. Confirm you see the Review App column listing your pull request. If you are quick, you may get back to the Pipeline dashboard and notice your pull request is listed, but the review app has not been created yet. No worries! It takes about 10 seconds for the deployment process to start after you submit your pull request on GitHub. So go ahead and click the Create Review App button to get the deployment process started. Click the View Log link to monitor the logs as the deployment is running. Once the app has been deployed, click View to verify your changes. You can no longer view the logs from the Pipeline tab. Click and click Open app in browser. Once the DreamHouse app opens, click the menu icon. Verify Mortgage Calculator is listed in the navigation. Navigate to your GitHub repo at https://github.com/YOUR_USERNAME/intro-to-heroku. Click the directory app > pages > welcome and open welcome.html. After line 4, copy and paste this line to add a title to the Welcome page. Scroll to the bottom of the page in the Commit Changes input box. Type Changed Title. Change the description to Title changed to Welcome to DreamHouse Realty. Verify the new welcome header by following the steps above in the "Verify your change using Review Apps" step. When reviewing multiple open review apps, you can visually see that the apps are completely isolated branches. Return to your GitHub repo and click the Pull Requests tab. There are two pull requests listed. Click each pull request. Scroll down and click Merge pull request and Confirm merge. Return to the Heroku Pipeline tab. The review app has been removed, and the change is being deployed into staging. Once the changes have been deployed to the staging environment, you can promote your app to production to create a new version for users. Click Promote to production… and Promote. 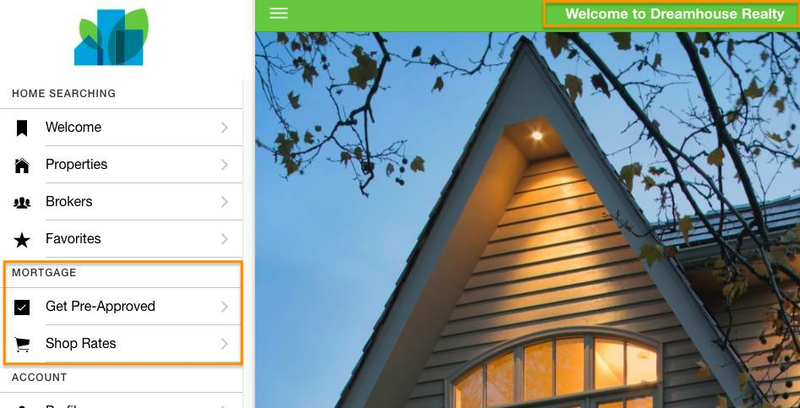 You have now created a new version release for any user ready to start their house hunt! But wait—although the user interface is complete, the properties in the production environment are not mapped to any Trailhead Playground. Let’s use the existing Trailhead Playground to connect to our production environment. When creating production environments, you wouldn’t use the same database in staging as you would for production. Normally we would need to create a separate Trailhead Playground specifically for production. For the sake of time, we use our existing playground. But if you are interested in creating a separate production org, launch a new Trailhead Playground, reset the credentials, and install the Dreamhouse package. Once you create your new Trailhead Playground, return to this step to continue setting up your pipeline. 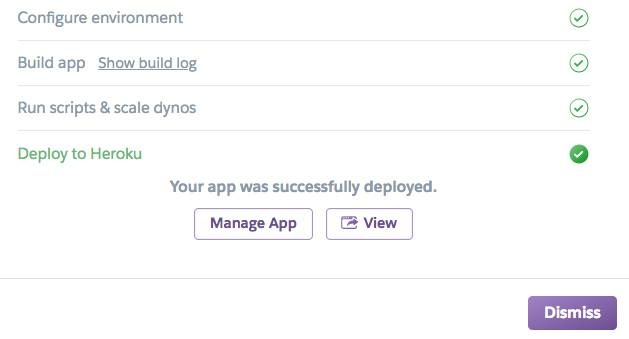 Navigate to the Heroku Pipelines Dashboard, https://dashboard.heroku.com/apps. Next to the name of your pipeline (dreamhouse-pipeline) it says 2 apps. Click next to 2 apps. Click the app named dhprod-UNIQUE_ID. Click the Resources tab and type connect in the Add-ons field. Select Heroku Connect to add this to the production app and click Provision. Click the Heroku Connect link under Add-ons. You are redirected to a new tab with the Heroku Connect dashboard and both of your apps are in separate tabs at the top of the screen. Click Settings then Import/Export Configuration. We export the Heroku Connect configuration and use the same settings for the production app that we used in our development app. Click Export. The Heroku Connect configuration settings for our development app are downloaded locally in a JSON file. To use the configurations we exported from the development Heroku app we import them into our production Heroku app. Click the dhprod-UNIQUE_ID tab at the top of the Heroku Connect dashboard. In the Overview tab, click Setup Connection. Click the schema name input and verify the text says salesforce, click Next. Click Authorize. Use your Trailhead credentials from either your original Trailhead Playground or your secondary production Trailhead Playground. Navigate to the Settings tab, choose Import/Export Configuration, click Import, click Choose file and find the .json file to import. Click Upload to begin the import. When the file has been imported successfully, Heroku Connect begins syncing data from your authorized Trailhead Playground into the database. You know it is complete when the Salesforce Rows and Database Rows display a value. Go to the Heroku dashboard of your production app, https://dashboard.heroku.com/apps/dhprod-UNIQUE_ID. Click More and then Restart all dynos. Click More and then View Logs. Once the state has changed to up, click Open app to view the production app. Congratulations! You have a completed Heroku Pipeline.